There are 7 mountains that God’s people should be influencing. Seven places to shine the Light of Christ into the darkness and bring life. 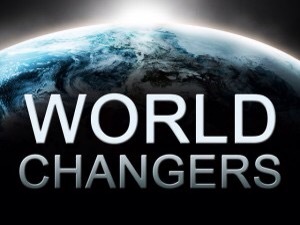 You are a WORLD CHANGER my friend! Where are you shining His light and love? Just by walking into a room the Spirit of Christ in you can touch hearts and change the atmosphere. We are vessels of the living God. We carry this treasure in broken vessels so His glory can shine through. It’s not us – it’s Him! There is a reason God says to “go”. There are people He wants to touch and things He wants to do. He came to seek and save the lost. And He will use YOU to do it. Take heart my friends, share your story, and watch and see what God does! Posted in Kingdom Authority, Music, Spirituality, Videos and tagged God, influence, Kingdom, mountains, music. Bookmark the permalink. Diana, had to delete the reblog because of the 7 mountain stuff. Bad stuff…..domionionism is bad news. I do love your blog tho and will repost the beautiful song. Hugs. Adrienne. Reblogged this on Yves Johnson Ministries. Please. Please. Please. Author and all the people who clicked “Like” on this (my friend Adrienne included), tell me that you were unaware of all this. The 7 Mountains Movement is one of the stealth ways the Christian Reconstructionist heretics are manipulating Christians into supporting their plans without them knowing that they are doing it. As a Christian, I intend to oppose Christian Reconstructionism, Dominionism, and Theonomy (and all their miscreant facets such as7 Mountains Dominionism) until my last breath on this Earth. They are all evil—and their ultimate purposes are evil. In the name of Jesus—Amen. Thanks for your insight Dover1954. I was not aware of the crazy teachings of Dr. Rousas Rushdoony. I have heard of the 7 pillars from Tommie Femrite and her book “INVADING THE SEVEN MOUNTAINS WITH INTERCESSION”. Here she teaches the body of Christ how to pray for those in leadership, not the crazy things from Calvinism and such. And that Christian Reconstructionist theology – wow, that’s just nuts! “If we as Christians accept the evil of this world as both inevitable and beyond our control, we lose our desire to fight it. That is exactly where the devil wants us: apathetic, ineffective and conquered. I had no idea. I just loved the song. Thanks for the heads up, Dover.